I am always on the lookout for new inspiration to furnish my period property. I have spent many happy hours pondering items at Vintage Fairs, in Antique Centres, and on the internet, considering their potential for use in my home. Freeloved turned out to be the starting point for my most recent project. 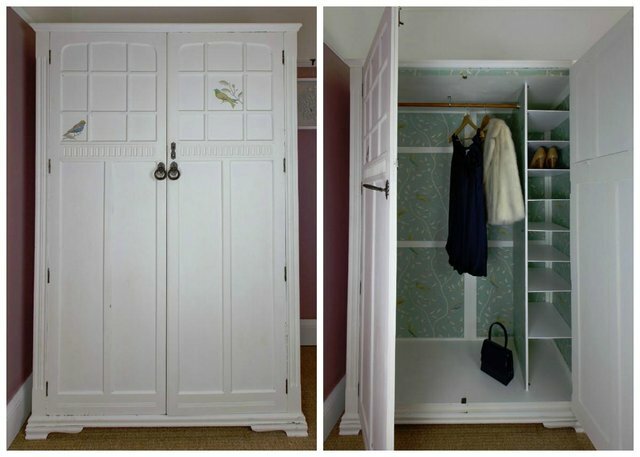 This beautiful wardrobe was being given away for free on Preloved. I could tell from the picture that it had potential to replace the uninspiring flat pack wardrobe that was making do in the guest bedroom. Using AnyVan, Preloved’s delivery partner, the wardrobe was delivered straight to my hallway without me having to lift a finger, for less than the cost of hiring a van to collect it myself. A quick inspection revealed that the wardrobe was indeed, “preloved” and that it would need a little TLC before I could star the fun job of painting. After removing the shelf I added a layer of plywood to the ceiling to give me an even surface. With a blank canvas, and knowing that any alterations would be covered with paint, I considered several options for adding storage space. In the end I thought that a shoe rack would be most useful. The shoe rack is painted in Farrow and Ball, Estate Eggshell, All White, which I had leftover from decorating. I’ve not painted any wooden furniture before so I was unsure about the best paint to create the effect I wanted. I had heard about chalk paint and, after a discussion with one of the traders at Levenshulme Antiques Village, I opted for Autentico chalk paint in Milk to create the lovely matt finish I was after. The paint claims to stick to most surfaces and the only preparation required was a wash down with sugar soap. It took 3 coats to get an even coverage, but I guess that’s not surprising given the dark colour of the wood! I waxed the painted wood with Autentico clear wax to protect it and finished off with a touch of sanding to distress the hard wear areas. I didn’t want to go too far as I knew that some natural and inevitable distressing would occur in the process of manipulating the wardrobe upstairs! 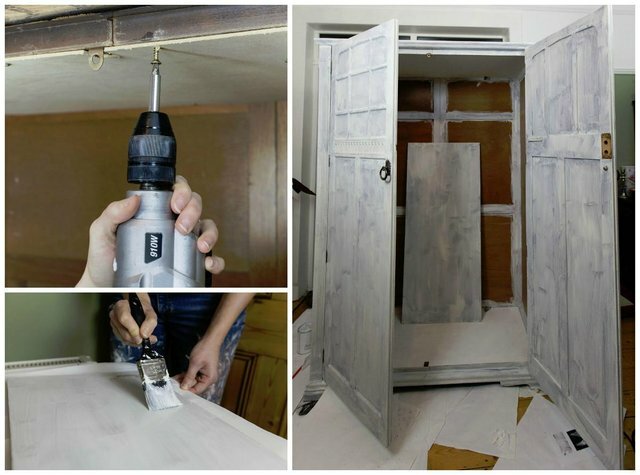 Although it will hardly be seen, I really wanted to wallpaper the inside of the wardrobe. I found this beautiful Sanderson paper to complement the bedroom colour scheme. After hanging the paper with wallpaper paste, I gave it a double coat of varnish to protect it from coat hanger scuffs. The hanging rail is cut from a curtain pole that used to live over our front door and fitted with new fixings. I cut out two birds from the wallpaper to give a teaser of what’s inside and glued them in to the beautiful panels on the doors. 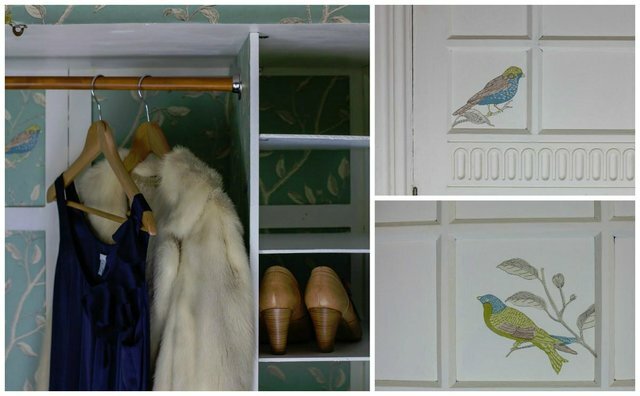 It was the panels that attracted me to the wardrobe in the first place and I feel that these little birds really set them off. There you have it! A fabulously unique wardrobe for my guest room that cost me next to nothing. 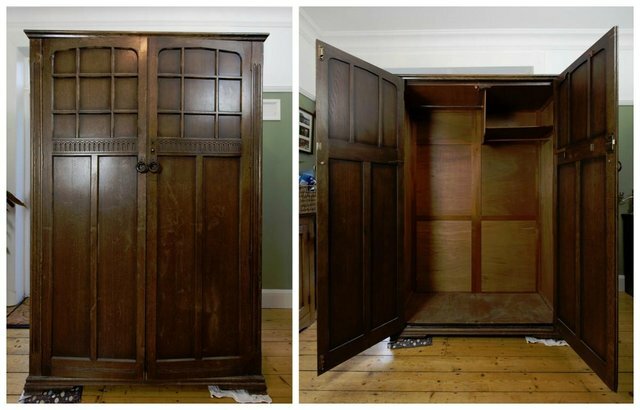 As for the old wardrobe, of course, I advertised it for free on Preloved and it has now been taken away to a new home! Why not see what gems you could find on Freeloved! 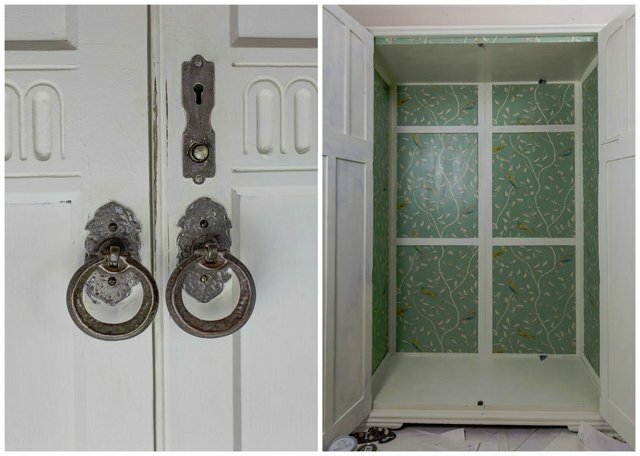 There’s a whole host of potential upcycling projects or Freeloved section! 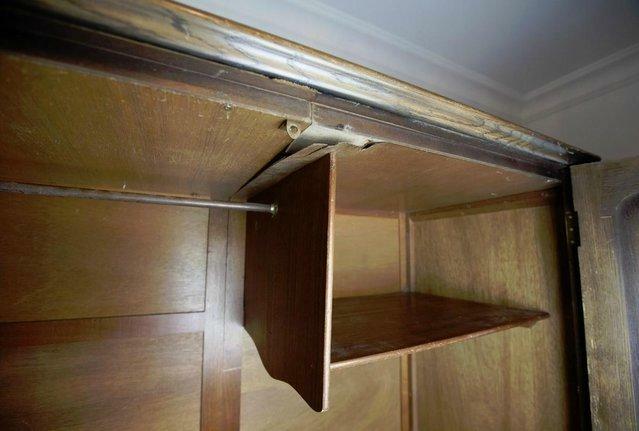 With furniture like this wardrobe, nearly new electricals like a 28-inch television, leftover building materials, exercise equipment and so much more, why spend out when you can find treasure for free?! Becci is a Preloved member and lives in a period property in South Manchester. She is always seeking outlets for her creativity, which is often put to best use breathing new life in to old things to furnish her home. She writes about her experiences in the world of craft, upcycling, and life in Manchester, over on her blog www.beccibrown.com.